Now that Easter is over with, I am left with some remains of Easter candy. My favorites were the Tootsie Fruit Rolls, which I would really like to buy more of if I ever manage to find them again. The little bag on the left with candy corn, jelly beans, and other pastel-colored candies was also rather nice, as well as very pretty. Wandering into Rocky Mountain Chocolate Factory one day, I thought to buy a chocolate bunny, but walked out instead with the holiday version of their Peanut Butter Bucket in milk chocolate. It has a green butterfly and ribbon--there were also yellow and pink varieties. If you've never had their Peanut Butter Buckets, do consider them next time you're in the store. A Reese's Cup turned from candy to confection. Then there are these milk chocolate umbrellas from Simón Coll Chocolatier, who also made the elegant drinking chocolate I tried last year. As usual I'm happy to see a quality chocolate make its way into the holiday selection. Although a simple, 32% cocoa milk chocolate, this chocolate is textured with nutty flavor and richness. You can break it into pieces, or just enjoy sucking on it like a lollipop, which is rather fun to do. I acted like a sophisticated child while eating mine on Sunday night during Once Upon a Time. A definite success. 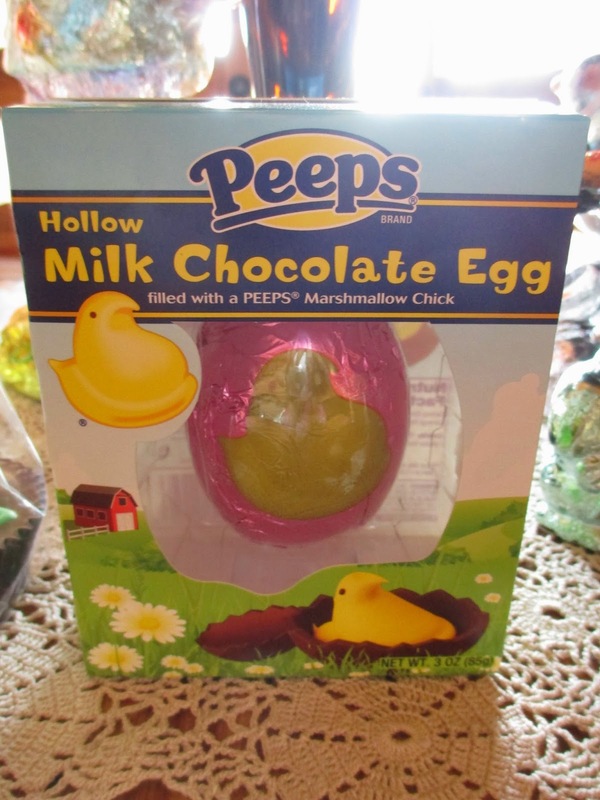 Returning to the realm of candy, we have this Peeps Hollow Milk Chocolate Egg. 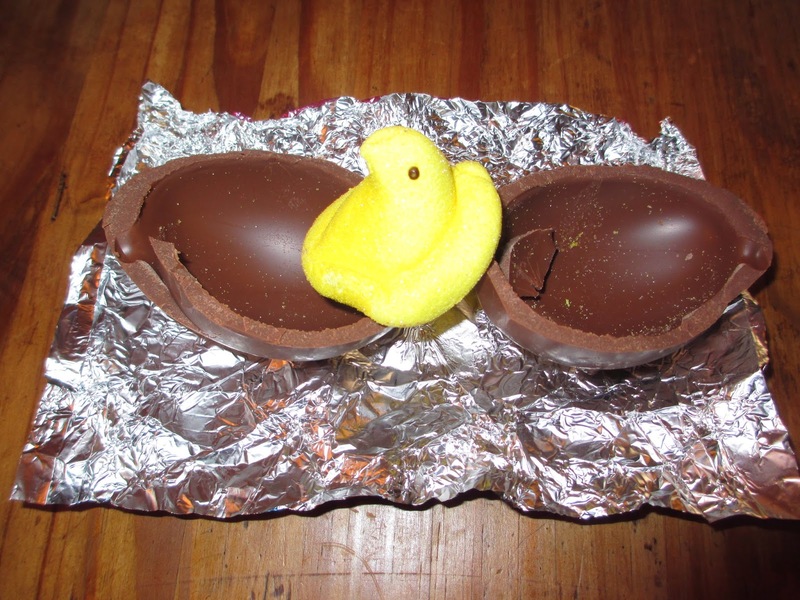 I'm not a major fan of either Peeps or marshmallows, but look how cute this is: it's a Peep inside of a chocolate egg. Adorable, right? The simple egg is fairly thick, so you get plenty of chocolate. I was somewhat surprised by the quality; it's possibly better than Hershey's (of which you know I have a generally low opinion). Maybe I only say that because I had a very small piece. Point is, it isn't worse than average--and much Easter chocolate is worse than average. I wasn't quite sure how to break into the egg, so I used my thumb and the shell essentially broke along the mold divides. Out pops one yellow Peep, which is just the right amount to have for the holiday spirit of it all without getting sick of hard, sugary marshmallow. Now why does the next holiday (aka. excuse for candy) have to be so far away?